While I typically do advocate the use of airline miles for Business Class and First Class flights, I managed to snag up a pretty good deal on KLM Business Class flights for me to take my family down to Bali for a long weekend. On this trip, I booked the Business Class tickets for approximately S$500 per passenger (return-ticket) which is only a fraction of what Singapore Airlines charges (read about my Business Class experience from Singapore to Bali on Singapore Airlines here!) so that to me is a great deal! Click HERE for cheap flights and hotel price comparisons! Getting from my place to the airport is fuss-free since spending S$6,000 a month on my OCBC VOYAGE Card gives me two complimentary airport transfers each month. Knowing that there will be four adults taking the trip, the OCBC VOYAGE team upgraded my limousine ride from a typical Mercedes E-Class to a Toyota Alphard to make the trip a lot more comfortable. At the time of writing, KLM flights depart from Terminal 1 and passengers traveling in Business Class will be able to check-in at one of the Sky Priority counters so there is always a much shorter queue. Since all of us were traveling in Business Class this time, we proceeded to the dnata Lounge in Terminal 1 (which is the allocated SkyTeam/contract lounge for this flight) for some light bites before the flight. I had initially wanted to review this lounge but the I have found it to be lackluster (maybe paling in comparison to the high standards set by the SilverKris Lounge and The Qantas Lounge both) - the decor itself is quite beautiful and I love what they have done with the space but the F&B offerings are pretty sad. I made myself two G&Ts (with the highly-regrettable Gordon's Gin) before leaving for my flight. Oh and if you do require the bathroom, they are located outside of the lounge. Thankfully, once you get past the fact that the lounge is a bit of a terrible place, the flight experience on KLM's 777-300ER Business Class is actually really enjoyable. When I took the flight from Singapore to Bali, Singapore Airlines has not yet announced that they will be using the new 787-10 Dreamliner for selected DPS routes. Therefore, when I took it, I was really comparing the KLM product with the existing product that they have on their A330-300s. The Business Class cabin of KLM's 777-300ER plane is configured in a 2-2-2 layout (much like the A330s on Singapore Airlines) and there are 34 flat bed seats (which is more impressive than the angled-flat seats on the A330s) here. There is a mini-cabin (Row 6) on the flight but those were blocked out when I was trying to select my seats for this flight so I ended up on Seat 1A instead (not complaining!). There is a total of 28 World Business Class seats in the forward cabin which is fairly decent so you do not actually feel like you are in a massive Business Class cabin which takes some of the exclusivity out (I'm looking at you, Emirates!). 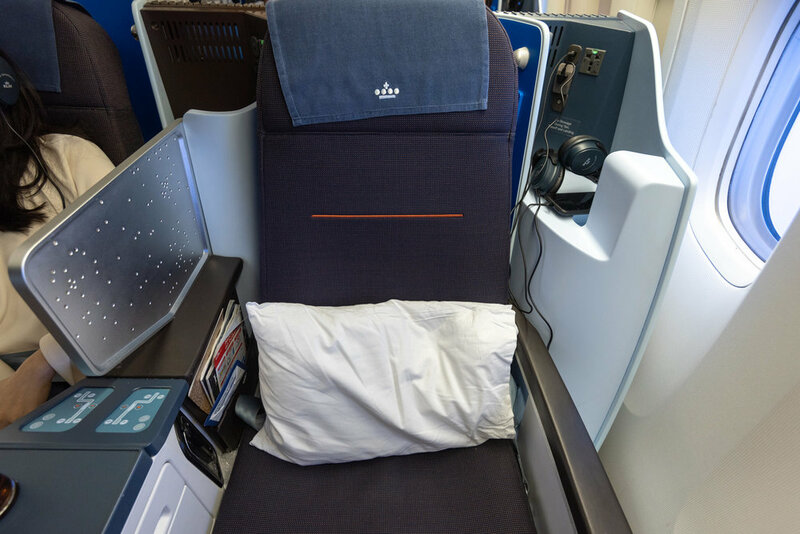 Compared to Economy Class, the World Business Class seats on KLM's 777-300ER has twice the seat pitch at 63" (versus 31" in Economy) and the seat width is also approximately 14% wider at 20" (as compared to 17.5"). More importantly, the food served in Business Class is significantly better and the seats can be reclined into flatbeds if you are interested in catching a wink. The controller for the In-flight Entertainment system is faulty in my seat and the cabin crew seemed rather worried about that - I told that it did not matter since the touchscreen is still working and they seemed pretty relieved after that (maybe because they thought I would ask for compensation?). In case anyone was wondering, the entire Business Class cabin is full so they could not move me to another seat even if I wanted to. I was offered a drink prior to take-off and I opted for a glass of Champagne - KLM pours Nicolas Feuillatte Brut Reserve in Business Class on this flight. I have not actually tasted this before prior to the flight but have found it to be palatable (at least it is at the right temperature and not almost room-temperature like on Air China). Something that I noticed about the footrests in Business Class is that they vary depending on which seat you get - the window seats closest to the aisle seem to have a larger area - but with that being said, there is still plenty of space for you to stretch out. There is also a small area for you to store your belongings (it could probably fit your laptop or tablet) but these should not be used during take-off and landing. Seat controls are fairly straightforward and there are two presets - one to return the seat back into its upright position (suitable for take-off and landing) and one to turn the seat into a flatbed. There also also controls for you to tweak the settings a little bit but nothing too radical. If you are sitting with a stranger (thankfully for me, I was sitting with my sister), there is a privacy partition between the two seats that provide some privacy - this is not adjustable however. Every seat in Business Class comes with a universal power outlet and a USB charging port so your device(s) remain charged during the flight. Noise-cancelling headphones are also provided on this flight but since Singapore to Bali is only a 2-hour flight, you will have to plan ahead if you wish to watch a long movie - there is also an alert if your movie duration exceeds the actual flight duration. The headphones are quite comfortable but I typically travel with my own whenever I fly. The (faulty) controller comes with a touchscreen as well as controls to navigate the in-flight entertainment system. Simple games are also available on the flight if you prefer to spend your time thinking about which move to make in order to destroy the most number of jewels. The scheduled time of departure for KL835 was 4:50PM but my flight was slightly delayed - it only took off at 5:24PM. Dinner was served shortly after take-off and it was delicious! The meals served in Business Class on this route are created in collaboration with Indonesia celebrity chef, Farah Quinn (if you have lived in Indonesia, you must have seen one of her cooking shows on TV at some point). The ikan cod pepes (not spicy unfortunately) is served with an acar salad and micro cress - delicious but it lacks the spice (even though I completely understand it since this flight attracts an international crowd after all). The main course itself was delicious and it is quite possibly one of the tastiest dishes that I have ever had on a plane. After the meal, I was offered some more Champagne and I thought it would be impolite to decline it. The cabin crew then went around the Business Class cabin to offer passengers some chocolates - I went for the milk chocolate one and even had my sister hold it up for a photo (those aren't my nails!). 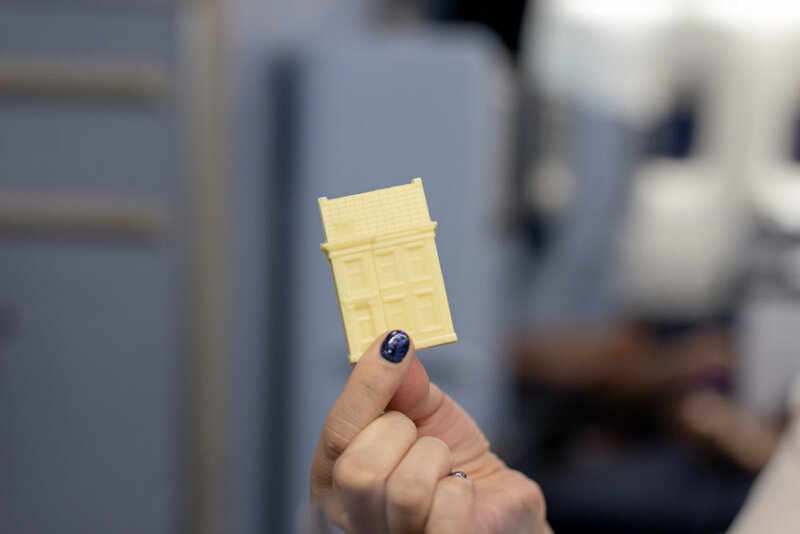 Once the chocolates were given out, the cabin crew then made their rounds with the famous Delft Blue miniature houses - these are an incredibly unique gift that only passengers in Business Class can bring home. Apparently KLM has been doing this since 1950s and it has become a tradition for the airline and also a collector's item for passengers - this was my first time in KLM's Business Class so I simply picked whichever one that looked the best but I will be sure to make a note on the ones that we have collected on this trip. The flight from Singapore to Bali on KLM's Business Class was really quite impressive and even though it is only a two hour flight, I thought that the experience was excellent! I will probably not pay full price for this flight but if you get them during a promotional period (which KLM runs a number of times a year), a return Business Class ticket will cost you only around S$500 each - flying the entire family to and from Bali for S$2,000 is not a bad deal if you are looking for a vacation to remember. With all that being said, now that the new 787-10s are used for selected flights between Singapore and Bali on Singapore Airlines, I am just not that convinced about the KLM product anymore - it is good but Singapore Airlines really has the upper hand right now with the beautiful regional Business Class product in a 1-2-1 cabin configuration.